OpenDataSoft came up with a smart and innovative approach that boosts the creation of new urban services. Providing deep insight in the potential of Open Data program, benefits of Open Data and Open Data market value. Transforming data into APIs, data visualizations, and real-time monitoring, making it easy for government organizations and business users to publish, share and re-use data with security as a major challenge. Why is Open Data an innovative program? An Open Data program can help you share your data with multiple users through different applications. Where, interoperability is the key factor in realizing the practical benefits of Open Data. This allows different organizations to work together on diverse systems and creating new opportunities through Open Data. You can share same data among your coworkers and create new platform which really helps. You can create your own data portal with attractive content in order to engage high number of visitors. You don’t need to worry about the technology used to store your data as there are many Open Data platforms available to streamline this process. Is your Open Data quickly and easily accessible and how often your Open Data is giving long term contributions to your community? Is your Open Data platform able to collect information from other IT systems and publish data automatically? Opening data can be challenging. 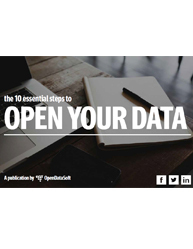 What data should you open first? What scope should you aim for? How to make sure your data will be used and reused? Which technical solutions should you consider? Download this white paper to know the answers of all these questions and provides the essential steps to be taken to start your Open Data project that meets the converging challenges with confidence.